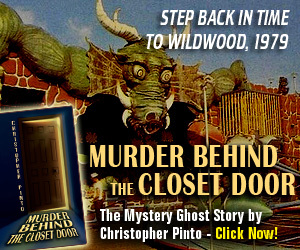 starring Kim Novak, William Holden, Cliff Robertson, Rosalind Russel, Betty Field and Susan Strasberg. (Ok, this flick takes place on Labor Day weekend, but we’ll pretend it’s Memorial Day) Drifter Hal Carter (Holden) blows into town to visit his old frat buddy Alan (Robertson). Alan’s old man is the town’s rich guy, by the way. So Carter, one of those guys who is really full of himself but doesn’t have dime or a donut to show for it, charms his way into talking the old man into a job…but of course, he doesn’t want to start at the bottom, he wants to run the place from the start. Meanwhile, Carter meets Alan’s squeeze, the incomparable Madge (Kim Novak). Madge’s old lady has been poor all her life and insists Madge marry into money…but of course, Carter sweet talks her until…well, you get the basic picture. There are some great scenes in this flick, ranging from full drama to silly comedy. 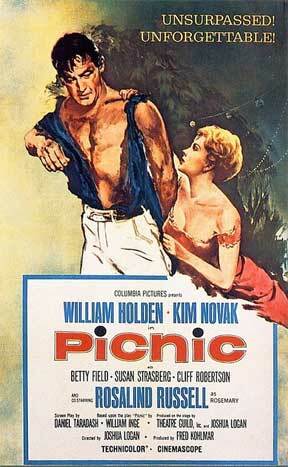 But the scene that it’s best known for is the dance between Kim Novak and William Holden, late night at the Picnic. The tension between the two characters has been building throughout the film, and finally comes to a head during one of the most impressive “fall in love during a two minute dance” scenes in film history. From way it’s filmed with the colored party lights in the background, to the “take me now” look on Novak’s face, the one of the greatest songs ever played in a movie, the scene is just perfect. Two songs, by the way…the dixieland party band playing throughout the picnic suddenly switches to a west-coast jazz version of the old standard “Moonglow”, then magically adds a string section when it sweeps in with “Picnic” to lay down the music bed for “The Theme From Picnic”, played in real life by Morris Stoloff, and written by George Duning and Steve Allan (Allan is credited for combining the two melodies into a perfectly-synced medley). Happy Memorial Day, kids. And thanks again to all the troops…remember the fallen, appreciate the active, respect the retired. 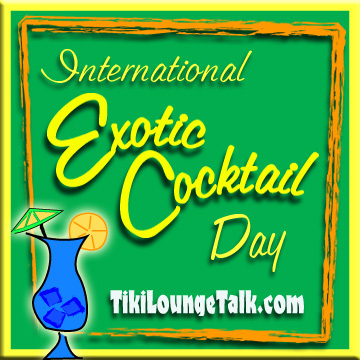 -Tiki Chris reporting from the poolside BBQ at Tiki Lounge Talk, the B-Lounge for hep cats and swingers. I wanted to post “How to have a great Retro BBQ” this weekend but I got into some other projects…so here’s at least one recipe you can still have for tomorrow! Promise to have the BBQ post up soon! When I was a kid, every time we had a BBQ my mother made the macaroni salad and my grandmother made the potato salad. My father and my uncle cooked the burgers and dogs on the grill, my aunt usually helped by making something that you could boil in a plastic bag (her specialty was Nibblits in butter sauce) and my grandfather would play with me while everyone else worked. • Boil the Macaroni as usual, until al dente…not too soft. Drain and let cool. Don’t rinse. • Meanwhile, dice all the vegetables into a large bowl and add the bacon bits. When the macaroni is cool, mix it into the vegetables. • Mix in mayo one heaping tablespoon at a time, until desired consistency. You want it to just coat the macaroni. Too much will ruin the salad. I use about 4-5 heaping tablespoons. • Add about a teaspoon of salt and a teaspoon of pepper and mix in. Cover and refrigerate overnight. The macaroni will absorb the mayo so you ‘mayo’ need to add more. (Get it?) Add more salt and pepper to taste. You can also add more of the red chopped onion to taste. Just be careful, if the onions are too strong they will overpower the whole thing. That’s it! Happy Memorial Day! Throw all the rum together in a shaker with ice and shakkkke. 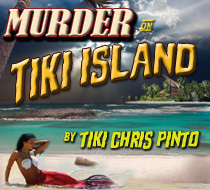 strain ovEr rice in a large Tiki mug, and fill with Coke. Thenn add about 2-3 teasppons of fresh lime juice an stir. MMMm. Strong stufff. If this video doesn’t make you smile, Jack you’re dead. 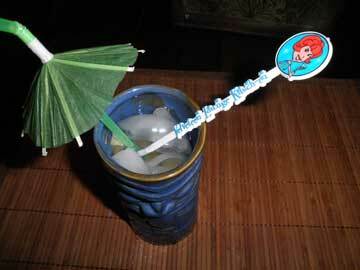 I would also like to thank Kelly Camille Patterson of The Velveteen Kitsch-en for the kookie cocktail stirrers. They’re tops! Look for a fun post on this crazy chick next week. Have a Great Memorial Day Weekend! And to all the soldiers who are being remembered on this weekend, I tip my hat to you, where ever you are. A child was born in Alton, IL on May 26, 1926. No one realized that child would evolve into the cat known as Miles. Skip the groove to 20 years later. Miles. Parker. Gillespie. Yeah. He was bop. He was Jazz. He could swing or play it straight, hot or cool, but cool was his gig. Then there was the horse, the big white horse galloping through his veins. It killed his friend, Bird. He quit cold turkey and never looked back. Modern Jazz. Progressive. Funk-Fusion. He did it all. 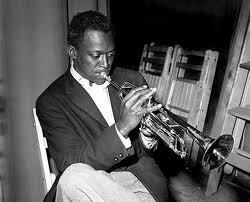 Birth of the Cool, Kind of Blue, Seven Steps To Heaven, Miles Smiles. He swung with the times, but always came back to his true Jazz roots. Miles left this planet on September 28, 1991, too soon, too soon. But he left plenty for us to dig. Speaking of Rum Barrels (see previous post), the little lady and I spent a nice hour at the Molokai Bar at The Mai-Kai in Fort Lauderdale last night for The Hukilau kick-off party. I was happy to see they were serving the Barrel O’ Rum in the barrel mug again (last time we were there they were out, said all of them had been stolen by guests). They’re also for sale in the gift shop for $17 bucks. It was really thrilling to see some of my Tiki pals’ art showcased in the gift shop. Art by Peter Janus (Tropiki, peterjanus.com), Bob Ho (Tiki Hana, tikihana.com) and Robert Jimenez (tikitower.com) was showcased among others, really giving the gift shop a more artistic, original Tiki feel than if it were just filled with touristy stuff from China. They’ve also increased their Tiki mug offerings, including having the Mai-Kai Mystery Bowl in stock for a low low price of $89 buckeroos. Oof. The bar was packed, by the way, and it took a while to get a drink…our waitress was really nice though, apologizing for the wait. Of course the drinks were half price for the party, so paying $7 clams for a Rum Barrel certainly made up for the inconvenience.